Here are a list of homes, neighborhoods and businesses who do great displays in the Williamsburg, James City County, Yorktown area. If you have a suggestion on a neighborhood or house that we should list please put it in the comments or email kristy.wf@gmail.com! 148 Sharps Rd, Williamsburg 23188 – it is right across from Kidsburg in the Meadows – See video below from last year. (Thanks to the Murdock Family!) Keep going on Sharps road and there are more homes that are bright and twinkling! Even the one facing this house it lit! Cherry Walk, The Meadows in Williamsburg 23188 – Go just one street over in the Meadows to Cherry Walk and you will find this lovely home! The home owner said it is a family event – they all come out to work on it! Village Square, behind Farm Fresh on Ironbound Rd in Williamsburg 23185 has done something amazing!!!! And I think they may have increased the lighted balls that hang in the trees this year. You will see beautiful balls of different colored lights high in the trees. We drove through last night and it was well worth it. Just watch out for parked cars and people walking as you are looking up at the lights high in the trees! I took pictures but it did not do it justice at all – but it is pretty! Jackson Drive, Yorktown (enter off of Penniman Rd and you cannot miss it). Tune your radio to 87.9 FM and you will have the holiday music from this house sent through your car radio (especially nice on a cold night). Thanks for the video – Mike & Susan! Fox Ridge off Centerville in Williamsburg 23188 – we hear you can’t miss it – just follow the glow of lights! Will get you a picture as soon as one is submitted or we take one ourselves! Longhill Station Subdivision off Centerville in Williamsburg, 23188. It’s on the main road when you turn into the subdivision across from the pool. They also have more decorations on the other side of the house, it’s just hard to get it all in one picture. Centerville Road and Richmond Road (behind the Harris Teeter) in Toano, this house looks like a little Ginger Bread house. Stars hanging from the trees light the way to this sweet house. White Hall Subdivision, in Toano (right before you get to Andersons corner) has some beautiful Christmas lights throughout the neighborhood! There are a lot of decorates since the neighborhood has a contest to see who can decorate the best. 105 Woodland Road – another great light display. Here are some businesses, shopping and parks that have great lights too! Merchant’s Square in Williamsburg – located on Duke of Gloucester St in the heart of Williamsburg – they have lights, strolling Santa, Christmas Carol performancs, an ice rink, restaurants and more! Brookdale has a great display on the hill facing Treyburn you can see it as you are driving on Treyburn on your left if you are heading to High Street coming from Monticello. Brookdale is 3800 Treyburn Dr, Williamsburg, VA 23185 but you will see the display from Treyburn you don’t need to turn into the neighborhood. We will post a picture once we get one! Christmas Town – this event at Busch Gardens never fails to delight all ages and is a beautiful display every year! This year they have 10 million lights!! 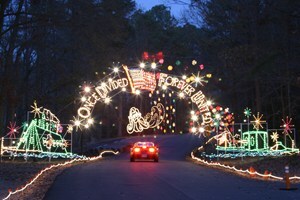 Celebration in Lights – Virginia’s first drive-through holiday light event – transformed by more than 800,000 individual lights, creating animated holiday and fanciful scenes along the two-mile drive into Newport News Park. Dominion GardenFest of Lights – Dominion GardenFest of Lights is a holiday tradition featuring more than a half million lights, botanical decorations, trains, holiday activities & more. Nov. 24-Jan. 8. (Closed Dec. 24 & 25) Tickets $13. Children $8. 3 and under free. Stern Family Holiday Light Show – 108 Sheffield Way, Newport News, Virginia. The Stern Family Holiday Light Show is created to help bring joy to all that come see the wonder that lights combined with sound make! 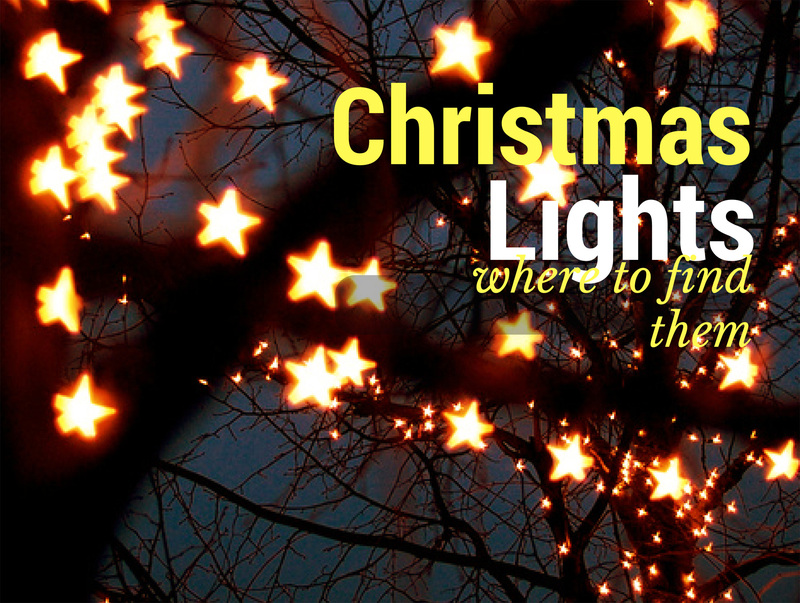 Is your neighborhood full of lights or did we miss a great lit location? Post it in the comments below or email Kristy.wf@gmail.com so we can add it to the list and spread some holiday cheer in Williamsburg, James City County, Yorktown and Surrounding Areas! 5 Kensington Court has a nice display including a floating star! What city is Kensington Ct. in please?